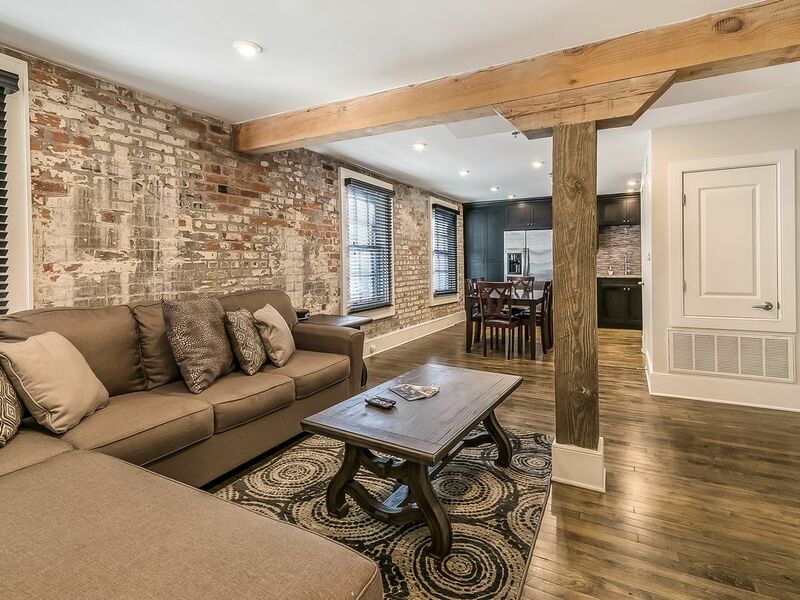 This one-bedroom, one-bathroom home is located around all things Vieux Carre. Located in one of the oldest buildings in the city, this charming condominium can host the perfect getaway. Located in walking distance to Bourbon Street, Café Du Monde, and Jackson Square, you're truly in the heart of it all. The Space – Equipped with warm, luxurious finishes, this spacious condominium provides endless comforts. One will find an open-concept kitchen area, accented by modern furniture and décor. There is one bedroom in this condo, comfortably accommodating up to two guests. The bedroom is fully furnished with pillow top king-sized beds with full bedding. A queen-sized air mattress with full bedding will be provided. You can find large flat screen smart TVs in the bedroom and in the living room, ready for all of your entertainment needs. Cook and dine easily in the fully furnished kitchen, equipped with appliances and cookware and dining area available to your guest and yourself. The bathroom is supplied with complimentary toiletries and towels for each guest. Relax and unwind surrounded by high-end finishes throughout the bathroom and living space. Orleans Vacation Rentals will provide clean linens and towels for each guest. Guest Access – Each guest will receive full access to the comforts of the suite through a front door key code. Rest easy knowing the comforts of home and the amenities of a stylish condominium are at the touch of a finger. Service – Our mission is to help you enjoy a grande New Orleans experience. We are available for guest needs at all times and will promptly respond to any issues. Also, don't hesitate to contact us if there is anything that we can do to make your stay with us more comfortable and pleasant. Proximity – The LaLaurie is settled in the iconic French Quarter, walking distance from the famous Jackson Square and Bourbon Street. Endless dining options just steps from your door: Doris Metropolitan, The Creole Cookery, Tableau, and MANY more. Like what you see, but it's not quite right? OVR offers multiple properties available in NOLA! Feel free to check out our other homes on our HomeAway/VRBO profile! The unit was simply perfect. The management team were extremely accommodating. I would definitely stay there again and highly recommend. The perfect French Quarter location! This Condo is beautiful. It is a bit quirky on the inside as the bedroom & ensuite bathroom doors open into each other. The back windows are above a restaurant courtyard which was a little noisy but never bothered us. The restaurant closes at 10PM. Fantastic Char Grilled Oysters & Crabcakes right next door !!! The king bed was very comfortable. I would have given this place 5 stars but the housekeeper failed to vacuum & mop before we arrived. There was hair, dust & dried food on the floor. She arrived the next day to clean up properly with the excuse she didn't have enough time the day before. I think some sort of credit should have been offered for our inconvenience. This is a great place. It was clean, new amenities, felt very safe and could not have been in a better location if you want to spend time in the French Quarter. Thanks for the great feedback, John. We appreciate you choosing us for your stay in New Orleans! Great apartment and Awesome location! This apartment had everything we needed for our NOLA stay. Really nice, modern and very clean! Just like the pictures. The location was just perfect, with everything we needed just outside our door. We will definitely stay here again and again! Thank you for choosing to stay with us, Alan! Excellent Location and Clean, Safe Place to Stay in the Quarter! My family of 4 (2 adults, 2 kids) had the pleasure of staying here over spring break. The property was clean, nicely decorated, and in a fantastic location, we loved being able to explore New Orleans and were in the heart of it all. I only gave it 4 stars for a couple of minor issues - the kitchen was stocked with only the bare minimum necessities - luckily we did not cook much because I am not sure we would have had enough dishes for one full meal for my family of four. Also, note that the walls are quite thin (although note they include earplugs), so you can hear other apartment noises, the cafe from downstairs, and the 5:30 am daily train that is in the area. Additional ideas for future guests would include a full length mirror, a new shower curtain and additional storage to provide more counter space in the bathroom for future guests. Overall, this is a great place and we thoroughly enjoyed our stay!! Thank you for choosing us for your stay, Sara! We appreciate the thorough feedback and will definitely make these changes. Great location, comfortable space, beautiful building! Located perfectly in the Quarter but placed outside of the central mayhem. You will get an impressive first impression when you arrive in the lobby & elevator. The accommodations are comfortable, and clean. There is noise throughout the day from the restaurant below, but we were usually too tired for it to really bother us. We would definitely stay here again. Thank you for choosing us for your stay, Paige!